Everyone faces issues about inheritance and succession. Whether you like it or not, you may face issues about a child or sibling who needs care, your future career, tax, the death of a parent or relative, wealth building, assets or the approach of old age requiring special care. 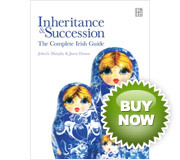 In Inheritance and Succession - The Complete Irish Guide, authors John G. Murphy and Jason Dunne, tell you about the issues that matter and advise you how to take the right decisions at the right time. 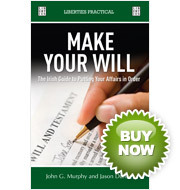 MAKE YOUR WILL , The Irish Guide To Putting Your Affairs In Order, by John G. Murphy & Jason Dunne, has just been published by Liberties Press. This is a sequel to their first book, the best selling Inheritance & Succession, The Complete Irish Guide, published in 2008. To contact the authors directly, email: info@johnasinnottsolicitors.ie. Young or old, single, married, seperated, divorced or cohabiting. They help you plan ahead. Click here for a free download of My Personal Affairs and Possessions List which is a key part of Inheritance and Succession - The Complete Irish Guide. Complete it, keep it for yourself or use it when consulting your adviser. To save a copy of My Personal Affairs and Possessions List to your PC, click the save button below. At the prompt click save again to save the list to your PC (usually to your My Documents folder by default). Allegations of undue influence ie. that the testator or person who made the will was coerced by somebody in to making the will in a certain way. Allegations of inadequate capacity to make a will ie. where evidence is available, medical or otherwise, that somebody did not have a appropriate mental capacity to make a will. Where the will itself is not "under attack" but promissory estoppel arises ie. where someone claims that he/she was promised the property and relied on that promise, but then find years later that a will does something different.